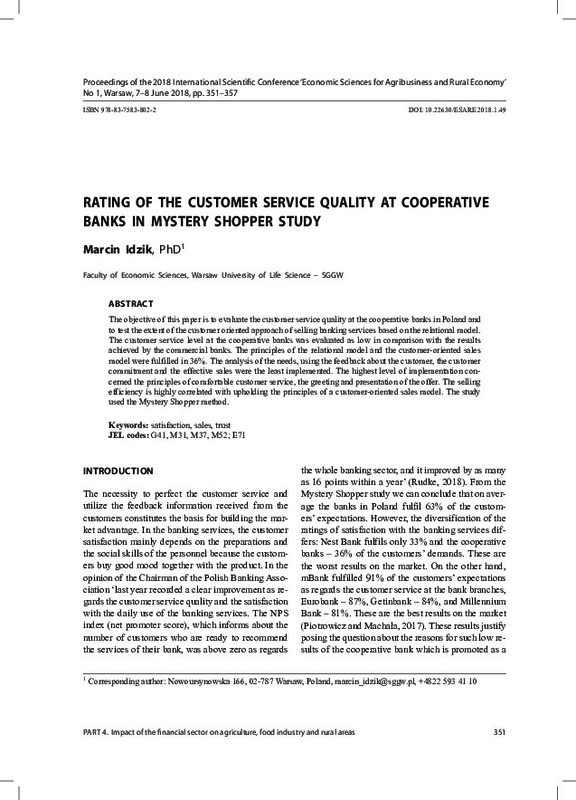 The objective of this paper is to evaluate the customer service quality at the cooperative banks in Poland and to test the extent of the customer oriented approach of selling banking services based on the relational model. The customer service level at the cooperative banks was evaluated as low in comparison with the results achieved by the commercial banks. The principles of the relational model and the customer-oriented sales model were fulfilled in 36%. The analysis of the needs, using the feedback about the customer, the customer commitment and the effective sales were the least implemented. The highest level of implementation concerned the principles of comfortable customer service, the greeting and presentation of the offer. The selling efficiency is highly correlated with upholding the principles of a customer-oriented sales model. The study used the Mystery Shopper method.